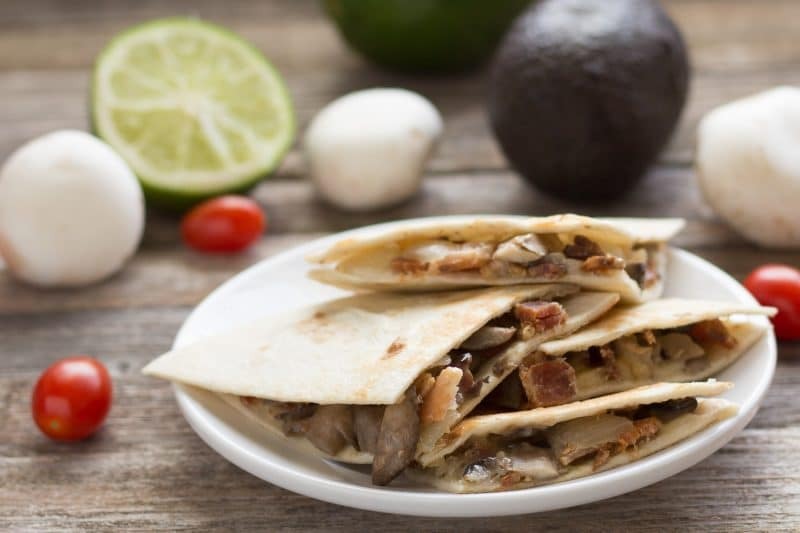 Easy Quesadilla Recipe breaks the mould and uses bacon, mushrooms, onions, and Jack cheese. Serve up a new tradition at your next party! 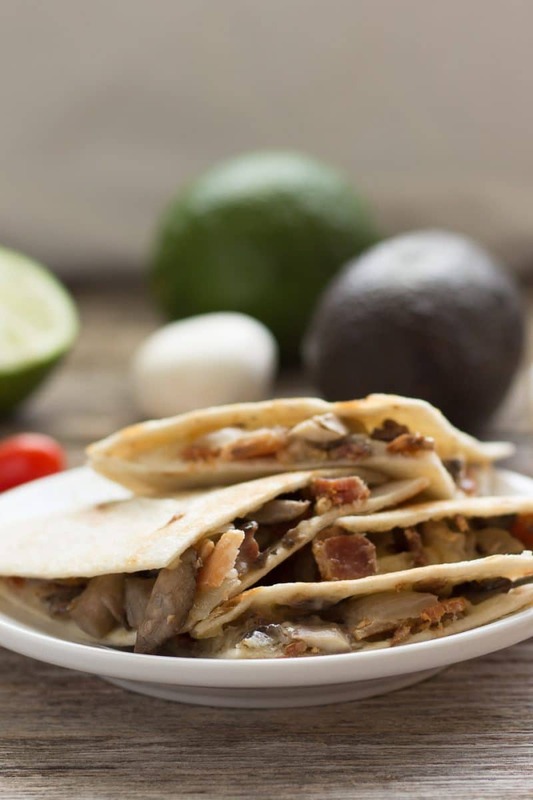 Crispy bacon, sauteed onions, and sauteed mushrooms are mixed with jack cheese and sandwiched between crispy toasted flour tortillas. Simple but perfect for serving at picnics, tailgates, and cocktail parties. Bacon Quesadillas were also inspired by a restaurant from back in my hometown. It was the first place I experienced the goodness of quesadillas. This recipe is a delicious twist to plain ole quesadillas. Your guests might be surprised by this version. Folks expect a recipe containing toasted tortillas with tomatoes, peppers and perhaps some chicken, beef, carnitas, or even barbacoa in them. Although, all of those options are tasty and I even think Ron may have one he will share on the blog someday, this one has none of the common ingredients in it except maybe cheese and onions. Even the cheese is not a common sight in quesadillas, this one uses jack cheese. I remember when I first started making these I had to shred my jack cheese by hand. These are so much easier to make now that shredded jack is readily available at most markets. Cheddar cheese or even a Mexican cheese blend can be used. We just prefer Jack cheese. 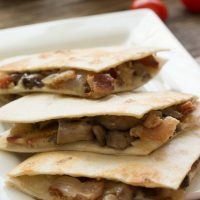 Bacon, onions, mushroom and jack cheese are sandwiched between two buttered tortillas then grilled, really griddled until crispy. I prefer using the larger griddle, it allows me to make 3 at a time. Served with sour cream, Pico de gallo, and guacamole is all we need for a meal in this house. They are also a favorite of guests during football season. The best way to keep these hot is to preheat my baking stone in a 450° oven while I cook the quesadillas. I cut them into quarters and put them on the stone and serve them right from the stone. The stone will stay hot for quite some time, making it perfect for keeping the quesadillas warm. Although, I have seen leftovers eaten straight out of the refrigerator. Do not place the hot stone on the rubbery side of neoprene pot holders – they will melt and make a mess out of the bottom of your stone and if you don’t realize you did it and you put the stone back in to reheat it later the whole house will smell like an oil refinery exploded in your kitchen. There won’t be smoke, just an odd smell that lingers. You will be heartbroken and spend hours cleaning smelly rubbery stuff off of the pizza stone that took years to get perfectly seasoned. Don’t be Beth, be smart and remember that your baking stone is screaming hot and could possibly melt pavement. 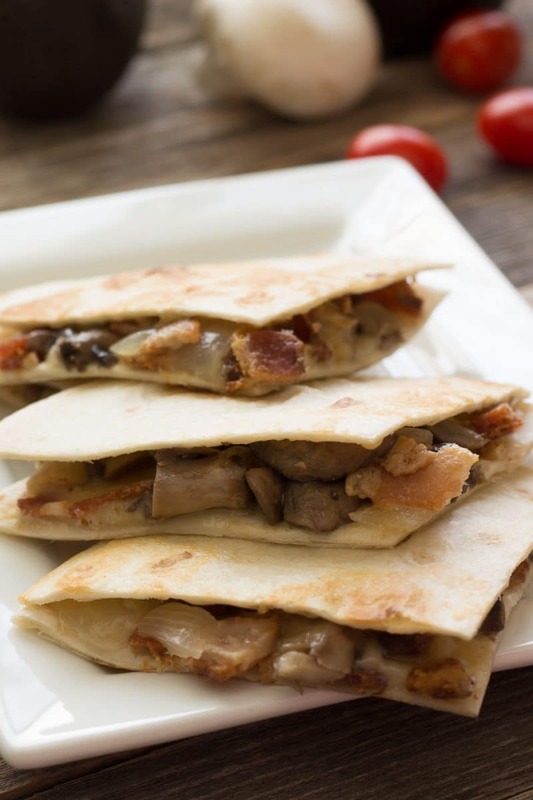 Leftover Bacon Quesadillas can safely be stored in the refrigerator for 3 or 4 days. You can re-heat them in the microwave for about 30 seconds for an individual quarter, but we like them best when they are slowly re-heated on the griddle. Griddle reheating brings back the crunch to the tortillas. 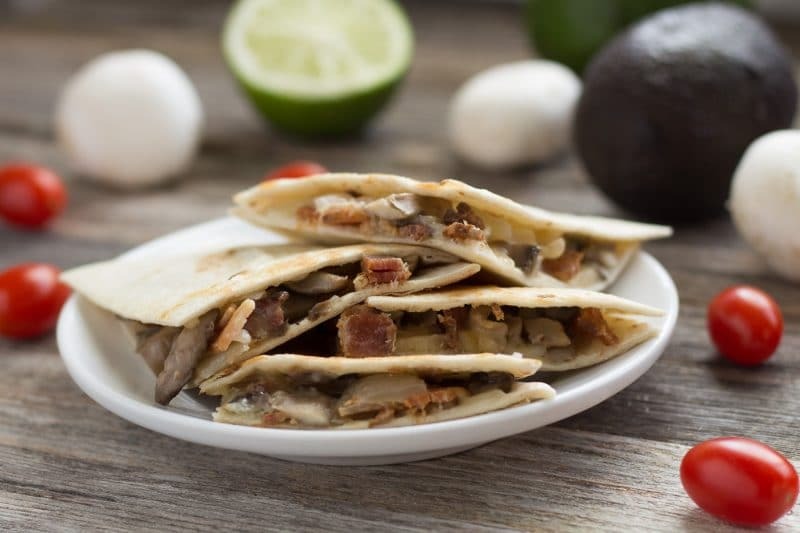 Quesadillas filled with bacon, mushrooms, onions and jack cheese. Perfect finger food for entertaining. Cut bacon into 1-inch pieces and fry in a skillet over medium-high heat until cook to your liking. Remove bacon from skillet and place on layered paper towels to drain, leave about 3 or 4 tablespoons of bacon fat in skillet. In a skillet with bacon fat over medium heat, add onions and cook until onions just begin to turn translucent. Remove from heat and place on paper towels or in a colander to drain. Leave bacon fat in the skillet. In the same skillet, add mushrooms and turn heat to medium. Cook, stirring often until mushrooms are wilted. Remove from pan and drain on paper towels or in a colander. Allow the cooked ingredients to cool. Placed cooled ingredients in a large bowl. Add shredded cheese and toss with hands to combine. Set aside. Preheat electric griddle to 375, or preheat a skillet over medium to medium-high heat on a stovetop. Take one tortilla and place butter down on a preheated griddle or clean skillet. Place a heaping 1/4 cup (or more if you like) filling on a tortilla and cover with another tortilla, butter side up, like a grilled cheese. Cook until the bottom tortilla has browned to your liking. Flip over and cook the other side until cheese is melted and the tortilla is browned. Remove to a cutting board and cut into four pieces. Serve warm with sour cream, Pico de Gallo, guacamole, and/or queso dip.